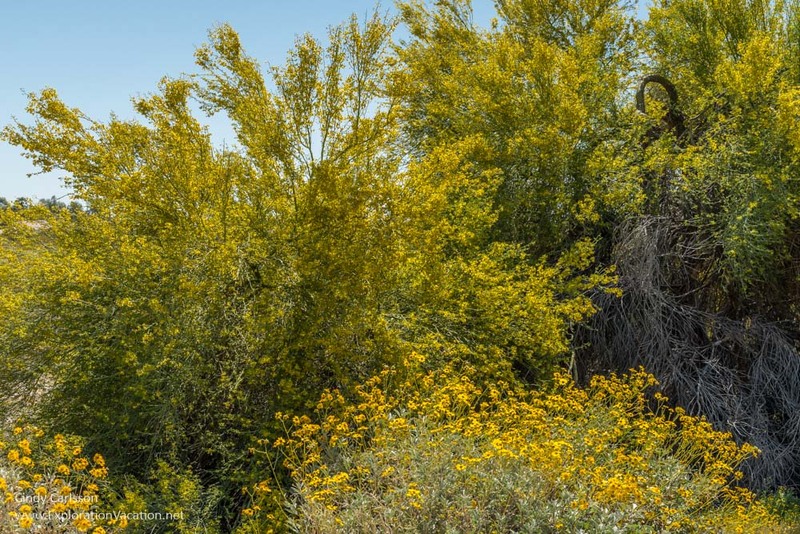 Arizona is famous for its gold mining history, but spring brings gold of another type as the palo verde trees burst into bloom. Visitors arriving in Arizona in January may not pay any attention to the leafless green trees found all around Phoenix. After all, they look pretty uninteresting. However, as the desert begins to warm, those green sticks explode into clouds of tiny yellow flowers. This is the magic of the palo verde tree. Arizona has both blue palo verde (Parkinsonia florida) and foothill palo verde (Parkinsonia microphylla). However, in the Phoenix area, the bigger, brighter, and more dramatic blue palo verde are most common. As a popular landscape tree, they can be found almost everywhere. Palo verde means “green stick” in Spanish. This small tree gets that name from the color of its bark on its often bare branches. That green bark is critical to the tree’s survival, as palo verde trees shed their leaves when hot weather arrives. Without leaves, the tree’s bark is responsible for performing photosynthesis. Those short-lived yellow flowers aren’t just beautiful to look at. They also produce edible seeds that made the tree a valuable source of food for native people in the area. While it grows in a number of locations in the southwestern USA, the palo verde is most is closely associated with Arizona. In recognition of its place in Arizona culture, it was recognized as the state tree of Arizona in 1954. Spring-time visitors to the Phoenix area are likely to find palo verde in bloom from mid-March through early April. Exact bloom times and the number of blossoms you’ll see in a given varies with the temperature and the winter rains. This post is linked to Floral Friday Fotos. Nice shots! Love the beautiful yellow. 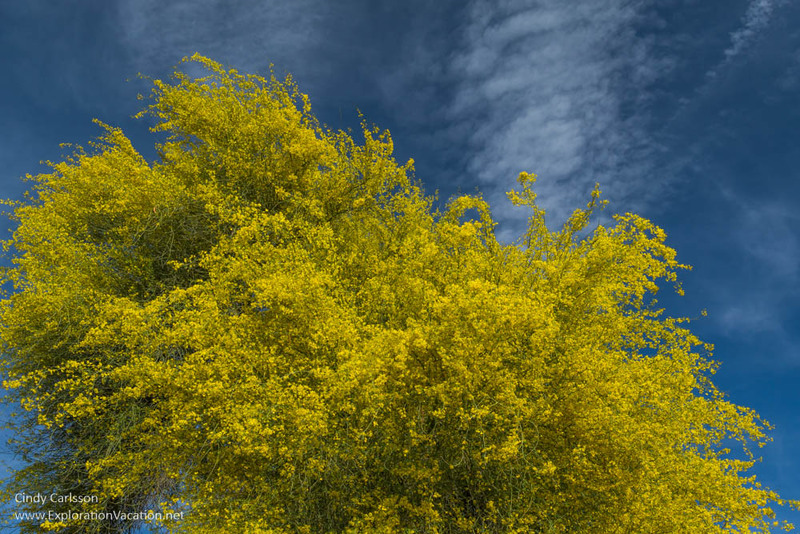 I spent several winters in Arizona and loved seeing the palo verde trees ablaze with yellow flowers at this time of year. A tip: don’t park a open-top convertible under a blooming palo verde tree. You’ll need to vacuum the yellow blooms out of it later. That made me laugh. It seems so obvious, but I can totally see myself doing that! I’m heading to Arizona in about 10 days so maybe I’ll catch some of the desert in bloom. That would be a bonus considering how hot it will be. Your photos are exceptional. The cacti seemed to be late this year and should be great while you are there. Not sure how into art you are, but if you want to escape he heat, there is a Frida & Diego show at the Heard and Western Spirit has a couple of good shows along with their regular western exhibit. Hope you are heading up into the mountains for hiking!